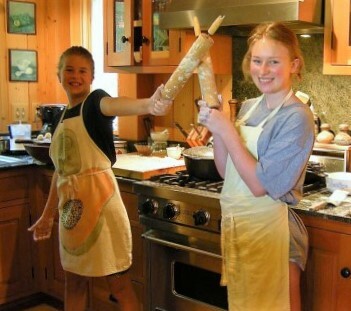 Are those the mitts . . .
For the wee hands . 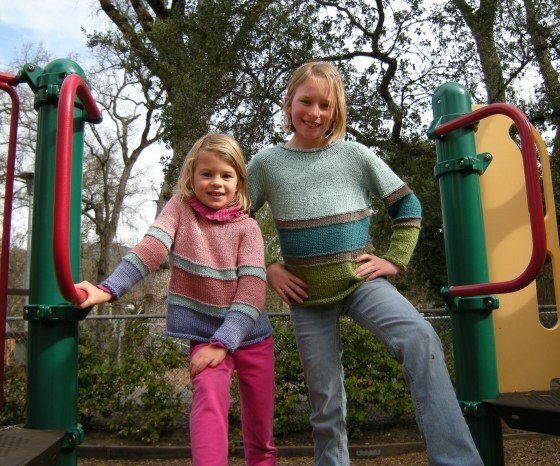 . .
that I knit for the wee Nora ? Nora who might not even be yet Two ?
. . . and they fit !!! 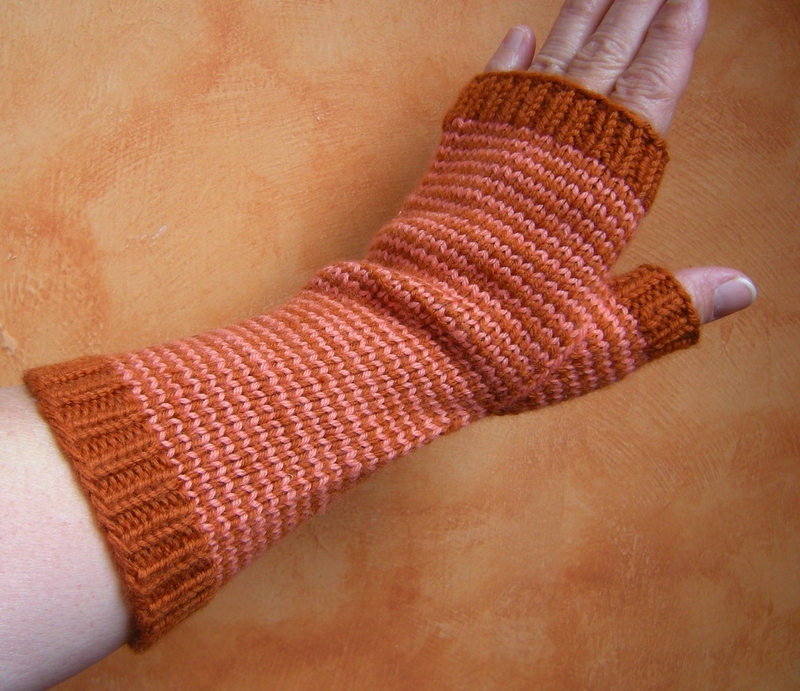 Stranded & Pin-Striped Fingerless Mitts ! 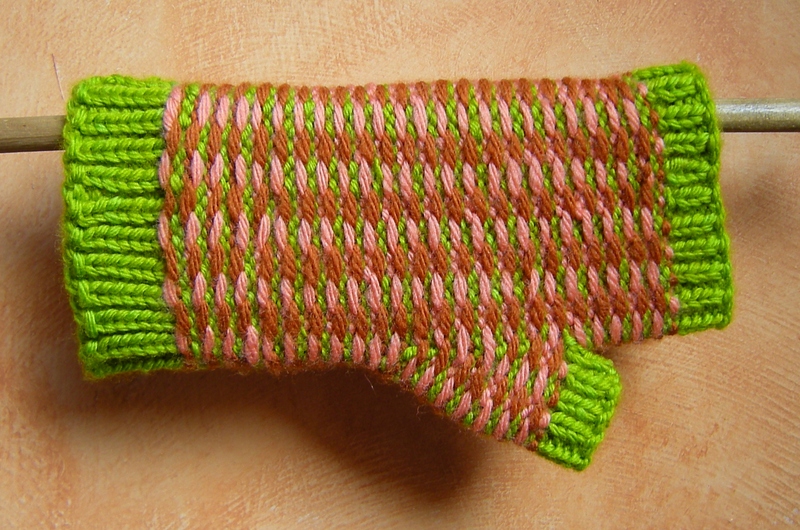 sister of the original ” Jenjoyce Pin-Striped Fingerless Mitt ” . . .
. . . and look at her inside-out ! 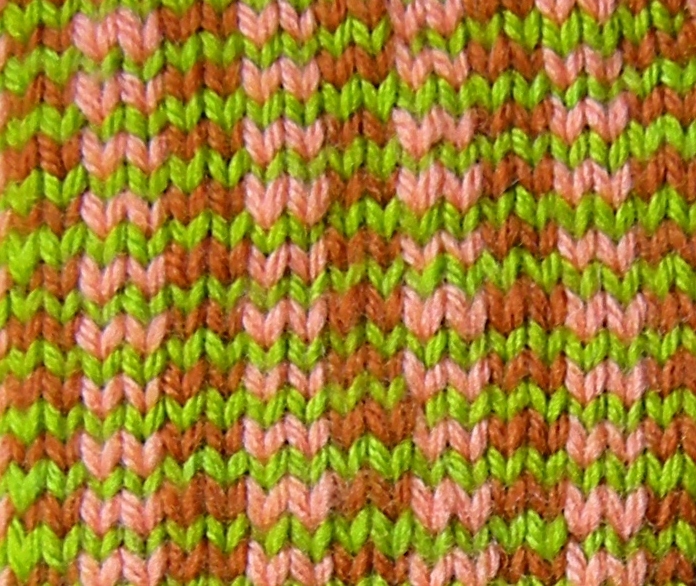 Here is a close-up of the color work ~ simply understated color stranding concept~ yet serious enough of a Fair-Isle effect, but on a completely basic scale. Therefore, I think this mitt & pattern is perfect for one who wants to learn how to do stranded color work , or loosely termed as ‘Fair Isle’ knitting. 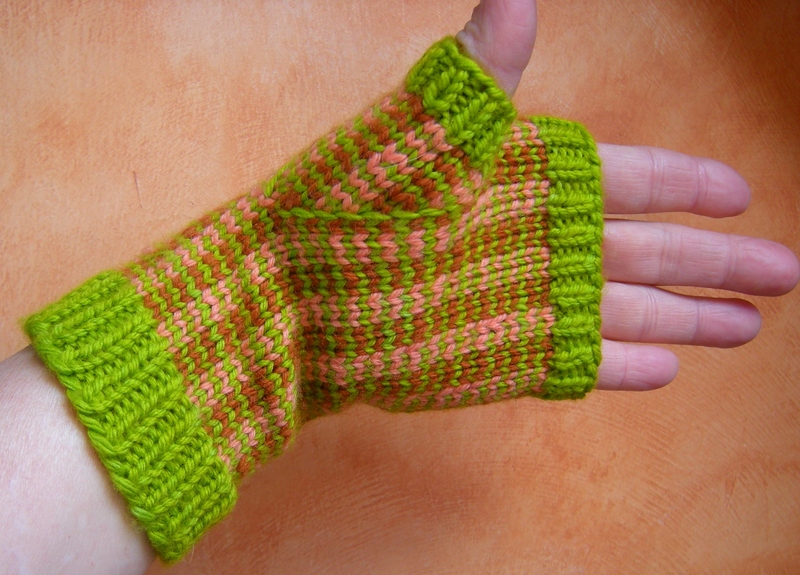 Some photos of them being worn by me (they are too snug in the photo, therefore when I wrote the pattern for these, I added one more 4-stitch repeat) . . .
All in all, I’m extremely happy, at this speedy second variation pattern writing came about, however haphazard and with whatever slight mistakes abound. I’m happy about it. 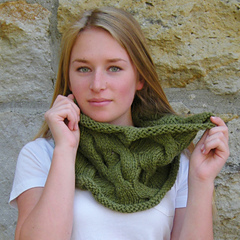 It’s my second pattern, and it’s uploadable for FREE …. right… over HERE !!!! I’d also like to thank Morrie & Lizzi for giving me all the help & support that can possibly be given. While I Was Out Walking . . .
. . . I brought my knitting. You’re not surprised are you? Well, this was raising the bar a bit on what I can do knitting-while-walking ~ I’ll be the first to admit ~ and I was pretty much only watching where I was walking every other row. (do not try this !) 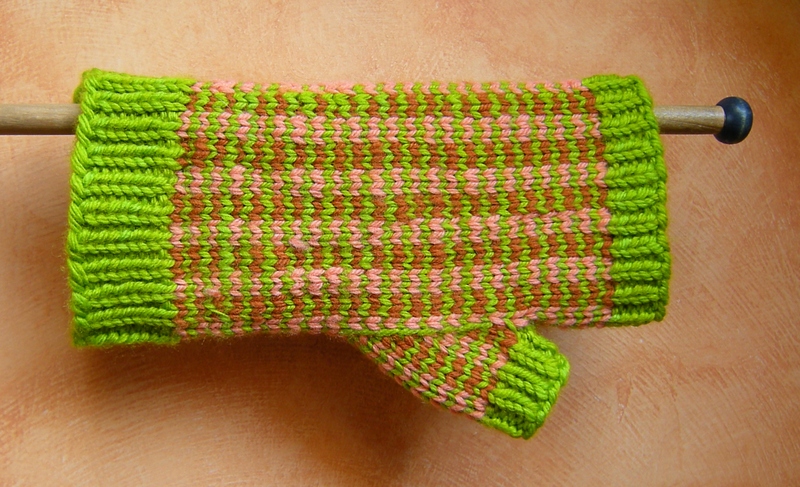 What we have here is a variation on the pin-stripey theme for still another pin-striped mitt . 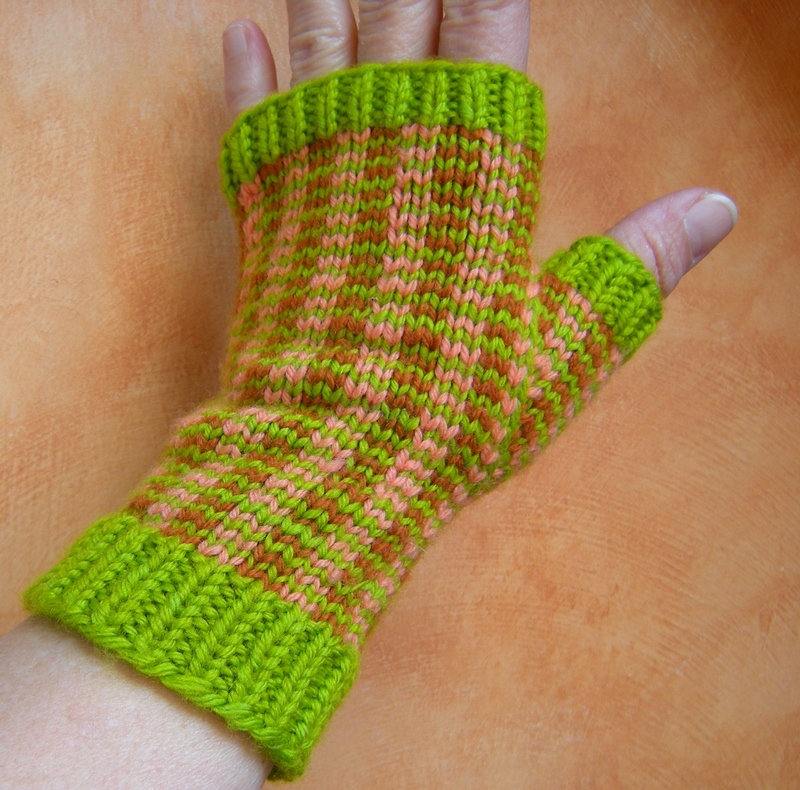 . .
Jenjoyce’s Pin-Striped Fingerless Mitts !!! Hey look, its my latest and greatest accomplishment ! Okay , so you have seen me make a zillion of these since before Christmas, and I just couldn’t tire of them, then Lizzi convinced me to write this pattern. You must have noticed the commotion over there in the sidebar with my “Thought For The Day” screaming jubilantly about having written my first knitting pattern ever , and the new advertising of a free download !!!! Well, the odd thing is now I really don’t see as why I should stop. This is a strange and new concept. I was totally blown away that before I even sent the pattern draft of a pdf to Morrie, she had already cast on to test-knit it. 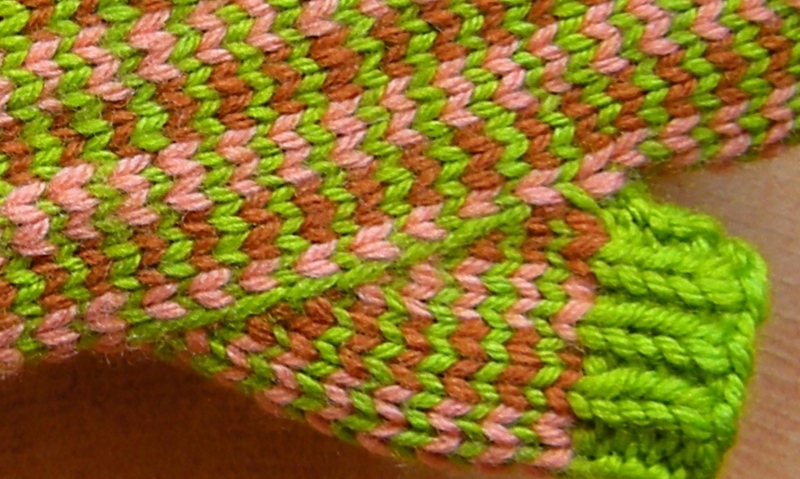 We chatted through the afternoon on gmail, as she test-knit away and as I knit up the above pair, while discussing the wording, the nature of ‘ jogless-ness ‘ , helix effect, and other such puzzles of the universe. Then the very next morning early with light just peeking through the sky window of my loft, I photographed these against the newly painted wall, and then I hurriedly slapped it up on Ravelry. 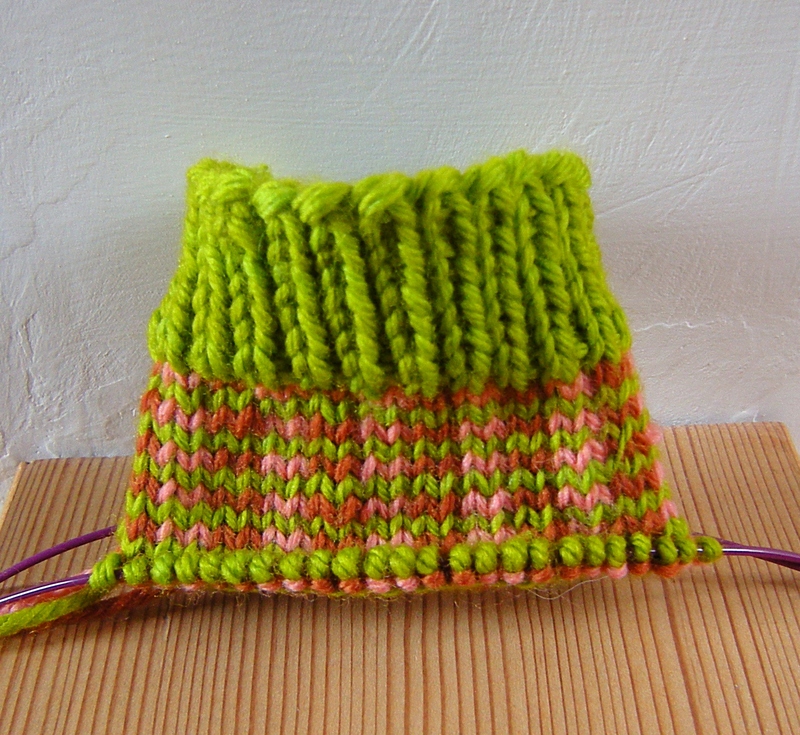 In one day friends, the little “Pin-Striped Mitts” got over forty ‘favorite’ hearts on my Ravelry activity , many queued, one project even finished (I see you Morrie!) … and a whole lot of ’em dowloaded ! 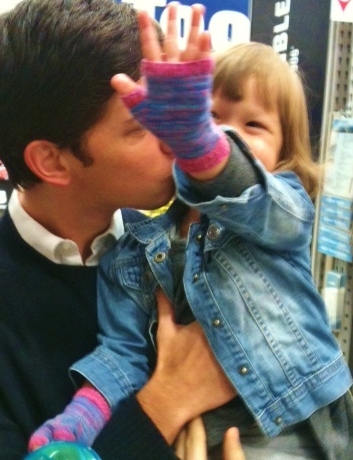 And boy did that really make my heart melt into a big puddle ! Excuse me folks for being so giddy, it just that for now, it’s all just a really big deal !!! 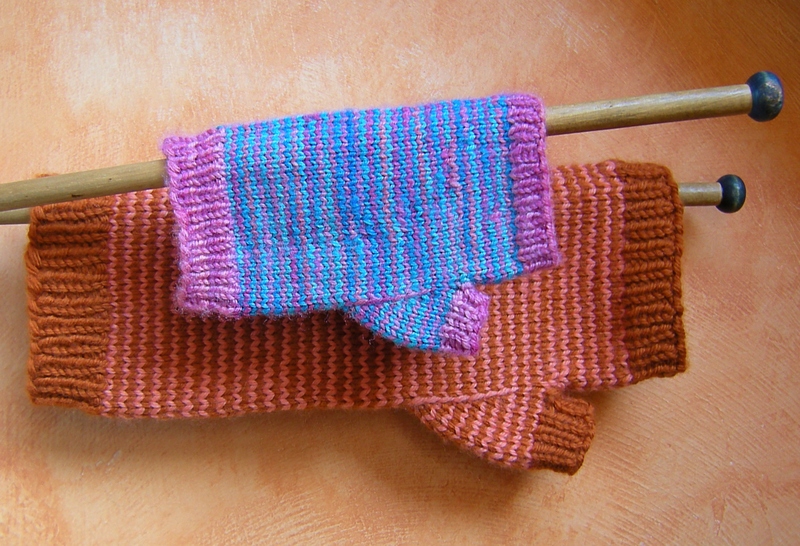 Another two pairs of pin-striped fingerless mits ! These are for Molly & Maya, belated xmas presents. For some reason, I can’t capture the colors very well with the camera . These are a medium greyish slate blue with marine blue stripes . . .
And these are a deep plum with royal purple stripes . . . 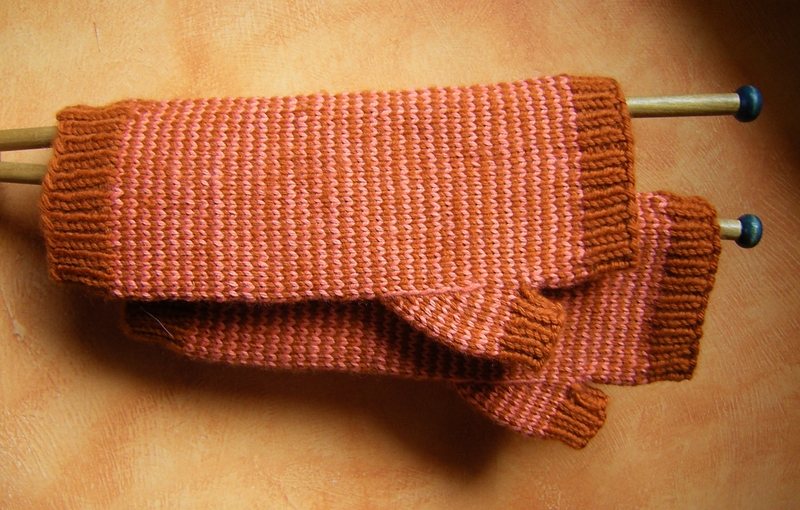 I think that five pairs of pin-striped fingerless mits are enough for me for a time, but since I knit them all almost entirely while walking the mountain, I’m not sure if I might not cast on for another pair . I mean, I fear I might trip without something to knit ! But for now I’m going down off the mountain into town to ship these mits in the mail, and then feel my feathers fluff up with a sense of satisfaction of a job done ! I find it difficult to believe that all the Christmas knitting is behind me now. I went for my walk this morning , and, nothing to knit while walking along ! It was surreal. 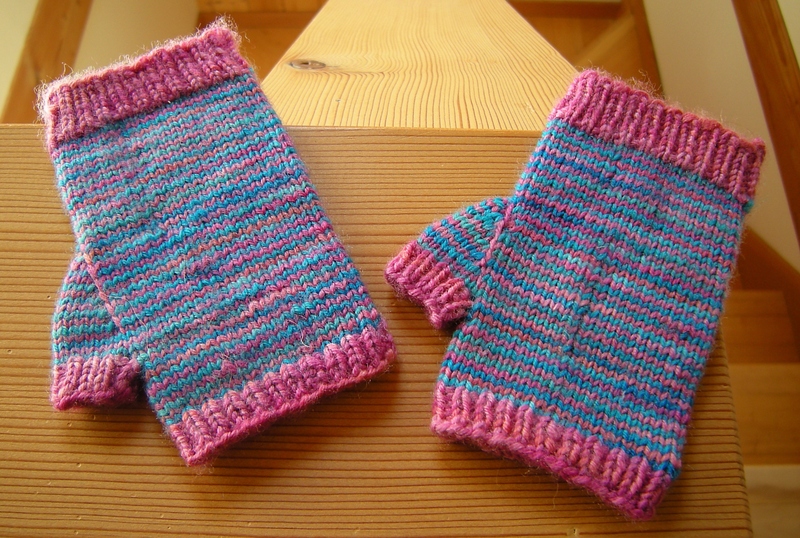 Here is another pair of fingerless mits knit up for Christmas ! The misty color combo is lavender and grey, a soft wintery colorway for one who has been very good and hoping for her first and very own iphone from Santa in a week, and from whom I’ll anticipate a lot of action on the Twittery front. Look here, can you even see where the pin-stripes join? A little tug at the switching of colors is all it took, and there it is… jogless ! I am dizzy from pin-stripes !!! Will there be no stopping me? Will I be pin-striping at Christmas eve into the wee hours of the night? 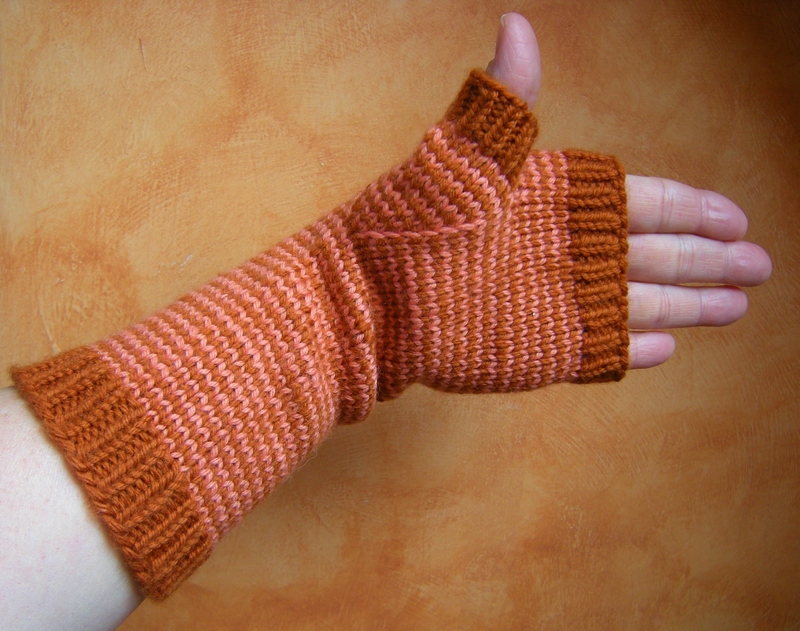 Will I bridge Christmas with the New Year doing nothing but more, more, more pin-striped fingerless mits , rationalizing still another recipient who might need a pair? There’s no way to really know, but to watch this space as they say.